Burnley have been accused of trying to “throw their weight around” over Nottingham Forest midfielder Henri Lansbury. Forest boss Dougie Freedman was defiant at the weekend that he will decide who stays and who leaves at the City Ground, after the Clarets saw two offers for the 24-year-old midfielder rebuffed on Friday. It is the third-successive transfer window Burnley have bid for the former Arsenal youngster, having seen a £3.5m bid rejected last summer, and a subsequent £4m offer in January. On Friday, Burnley’s latest gambit on the Forest captain was dismissed as “too low to comment on” by Freedman, before a “seriously improved bid” later in the day failed to trigger a clause in Lansbury’s allowing him to leave the City Ground if a club offer a certain fee, thought to be in excess of £4m – although it is understood that clause only applies to Premier League clubs. Lansbury was in action on Saturday as Forest drew 1-1 with Swansea City at the City Ground, and afterwards Freedman made his feelings known: “Henri is a real good guy and these things will not affect people like him. “I remember when I was playing, it might have affected me. But people like Henri and Robert Tesche are different. They have good values. 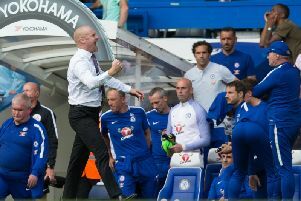 They can perform on the pitch, as they have shown against Swansea, without things like this affecting them,” said Freedman. “Burnley talk a good game, they try to throw their weight around. But it does not influence us at all. “Henri is my captain, he has done brilliantly for us and he is a fantastic guy to work with. He is good quality. “As far as I am concerned, the chairman has a few quid and he is a good man. He has been fantastic. He has told me, very openly, that I pick the players, pick the team and I decide who stays and who goes. That is what I have done this summer. “We have brought in a couple of good signings. We will continue to try to do that. “Because we are under an embargo, people think that we need to sell our players. People think that we have to do that. “But we do not need the money. The chairman has a few quid in the bank. We have, unfortunately, before my time, gone over the rules, when it comes to what we have spent, as have a few other clubs. Sean Dyche, as ever, was keeping his cards close to his chest after the 3-2 defeat at his former club Chesterfield on Saturday: “We’ve been working hard behind the scenes on a number of other different situations and it still takes parties to say ‘yes’.